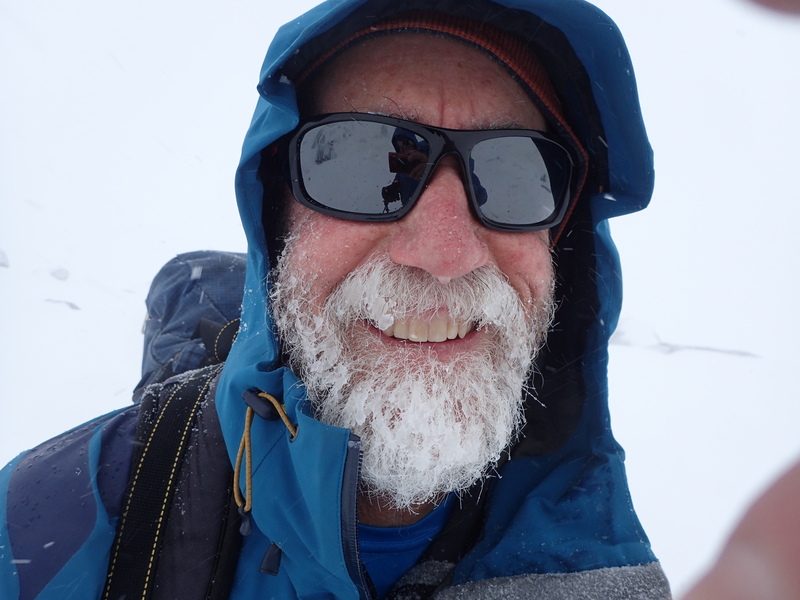 Here’s my personal best of “Seven Alpine Mainland Winter Summits” of Australia. The list is made up of the most enticing peaks for lovers of interesting winter mountain ascents. While including the highest mountains in mainland Australia a few are not in the seven highest. 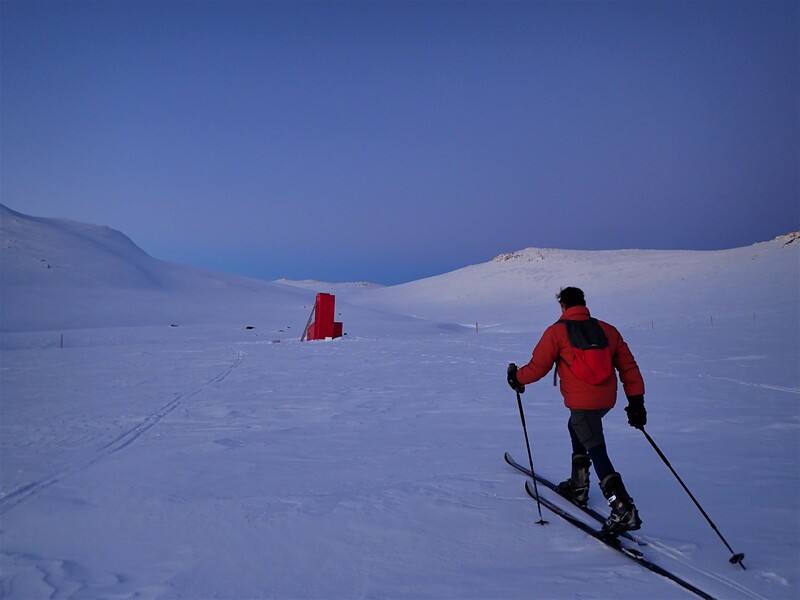 All have their own challenges that may include ice and snow, remoteness, changeable and extreme weather conditions. None should be underestimated, especially in winter. The idea of these “seven summits” is to focus attention on the local landscape in a way that captures the imagination and stimulates the thirst for adventure. So far in four attempts I have been successful on three of the peaks and have turned back on two. Mount Townsend is off the beaten track. 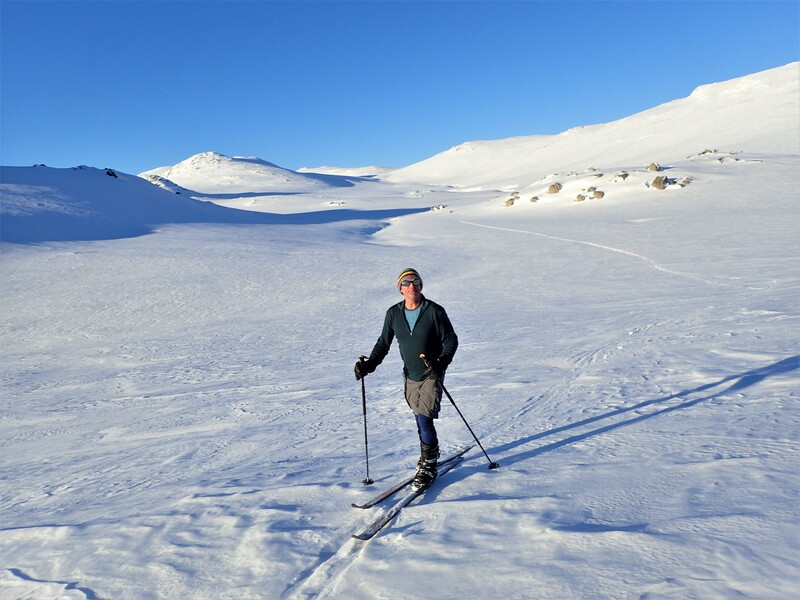 Further out than Kosciuszko and away from the standard Main Range crossing route it is generally more than a day trip in winter unless snow conditions and the weather is perfect. From the Eagles Nest café at the top of the main Thredbo chair lift we cross country skied up along the route of the Kosciuszko Walk. Occasional sections of the metal boardwalk were visible poking through the good snow cover. Apart from an icy breeze the weather was clear. The view from Kosciuszko Lookout at the 2km mark showed the next part of the route. Fresh powder snow made the uphills easy with our patterned ski bases gripping nicely, and the gentle downhills a dream. Sections from Etheridge Gap to Rawsons Pass were icy. With summit fever for Mt. Townsend we bypassed Kosciuszko and traversed across its northern ridge line to Muellers Pass. The windswept ridge to the top of Muellers Peak was alternating ice and powder. I strapped my skis onto my backpack and just walked up. On the hard ice of the Main Range sometimes it’s easier to walk if you don’t have climbing skins for your skis or snowshoes. From the top of Mueller a stunning vista opened out to the north – frozen Lake Albina, Little Austria and Lady Nothcote Canyon backdropped by the spectacular Sentinel and Watsons Crags with Mount Jagungal lying distant and aloof. The traverse of Mueller felt almost like a mini mountaineering exploit with a narrow rocky ridge perched high above plummeting slopes on both sides. We left our packs in the bowl below Townsend’s peak and skied easily up to a flat part of its eastern ridge. From here we kicked steps up the final steeps to the summit. Alone. We stood on the very edge of the Snowy Mountains. Massive wedding cake hills made up the Main Range with only Kosciuszko a little higher. Snow gave way to green forest thousands of feet below and to the west in the Geehi Valley which merged into blue range upon range down into Victoria. Dazzling light. Huge sky. Pristine white. Hardly a sign of civilisation in the enormous landscape. It was difficult to tear ourselves away. 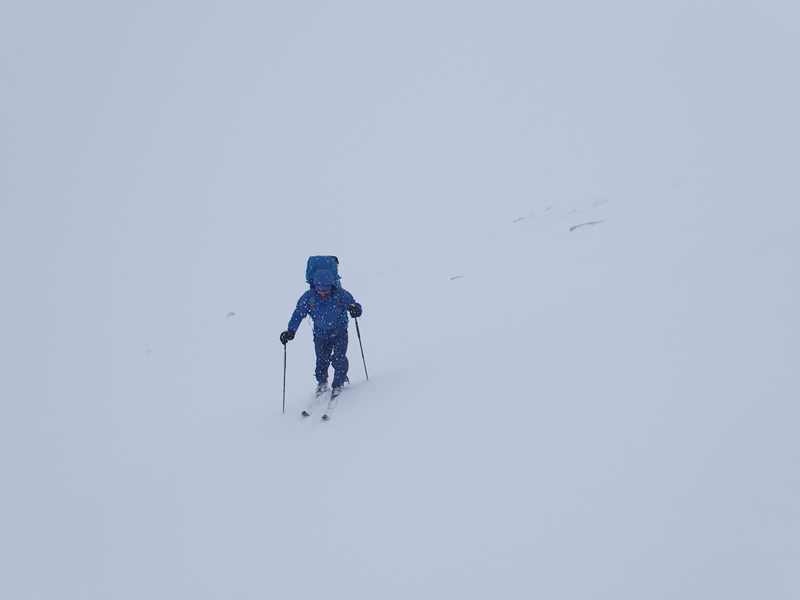 Then we thrilled in the perfect, consistent snow and telemarked back down to our packs and lunch. 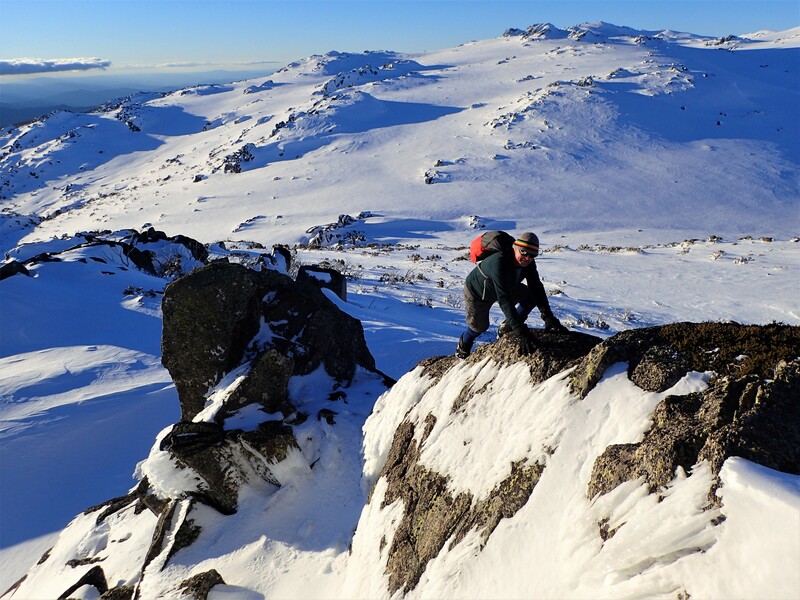 On the western side of Muellers Peak and Kosciuszko is a large, gently undulating shelf that hangs high above the valleys. 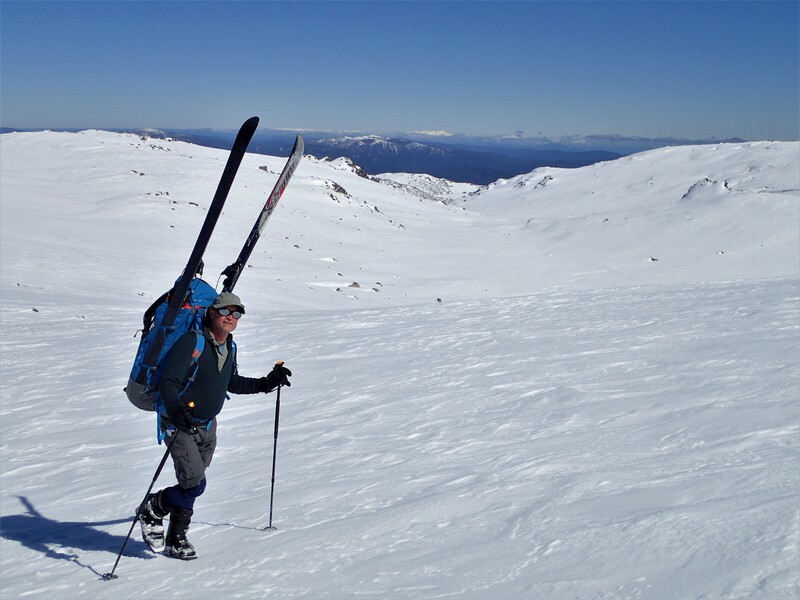 This is a relatively seldom visited area of delightful ski touring in good weather. 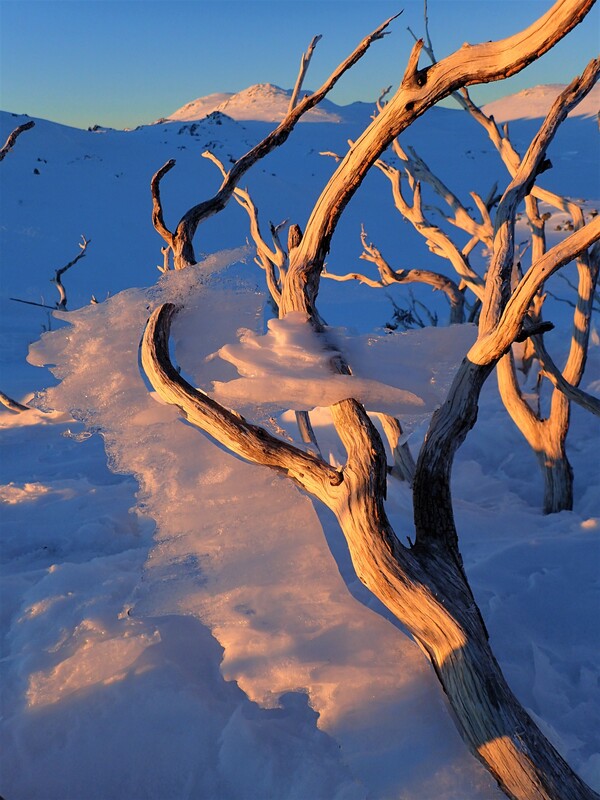 In the mid-afternoon we rounded the southern ridge of Kosciuszko into the headwaters of Swampy Plain River which flows out of Lake Cootapatamba. From a peak nearby we watched the sun set behind an approaching bank of dark clouds. 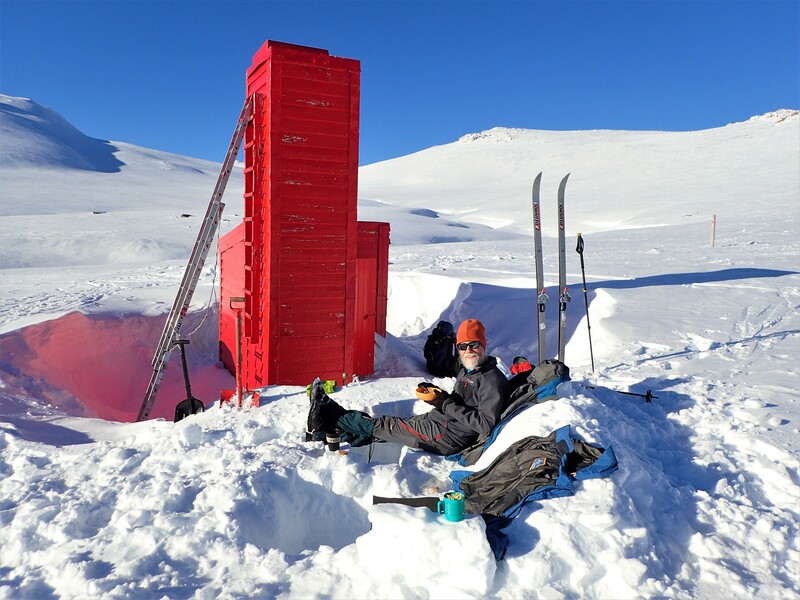 Cootapatamba Hut, a small survival hut, made for a comfy overnight. In the middle of the night it was a better option than our snow tent as a blizzard hit. About 10cm of snow had fallen by morning. 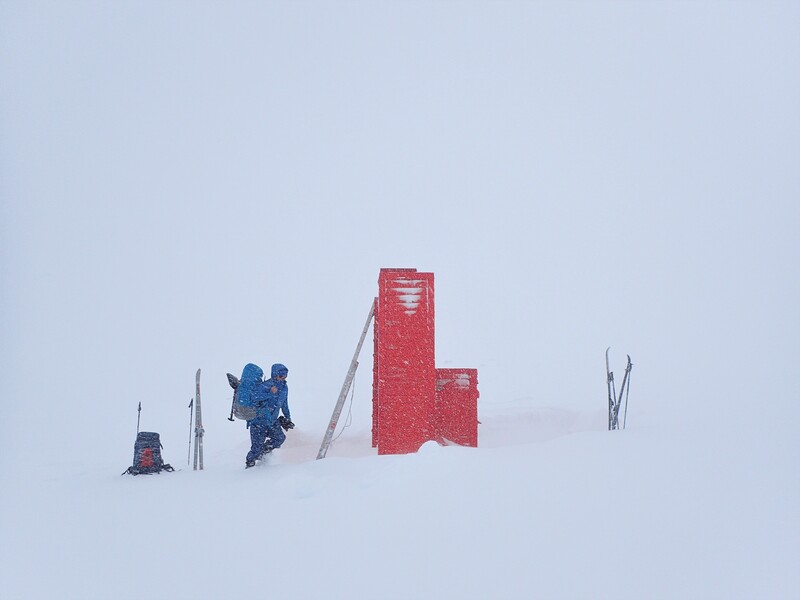 The forecast improvement in conditions did not eventuate so we set off into the storm in limited visibility, blowing cold wind and snow showers. On a compass bearing and with snatches of clearing we climbed steeply up to North Ramshead, then down to Kosciuszko Lookout and back to the top of Thredbo. As we descended the downhill ski runs the weather improved and the sun even came out. 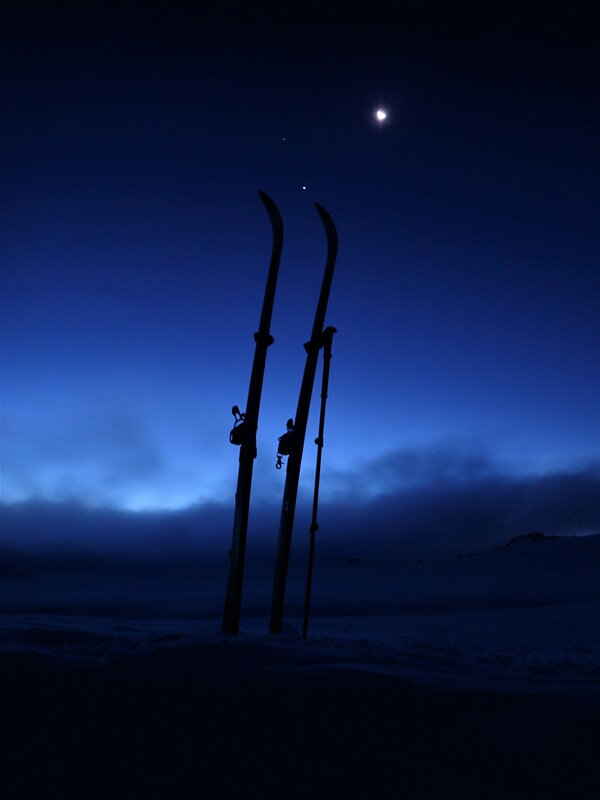 In 1 ½ days we had experienced all the weather of the Snowys in winter – blistering sunshine to blizzard, and the full range of snow conditions from sheet ice to brilliant dry powder. Postscript; Several years prior I had encountered an international party of mountaineers who set off, against local advice, into a blizzard to climb Kosciuszko which was their last of the “real” Seven Summits of the world (the highest mountain on each of the seven continents). They did not make it and had had to be rescued by police and NPWS staff who put their own lives at risk. With a tight time schedule they had been turned back and flown out having failed on Kossie after summiting Everest, Denali etc. Day 1 – approx. 18 km. Day 2 – approx. 4 km.